1/2 Price Sale on DJ Amplifiers, power amps, dj amps, and pa speaker amplifiers. Trust Cheap DJ Gear for extreme values on high quality DJ amplifiers. If you're looking for "cheap DJ amps," they're not here. This is the good stuff, priced like cheap DJ amplifiers to SELL! This is where you'll find PA amplifiers for every need, whether it's a PA speaker amplifier or a full-range DJ power amplifier. You'll discover incredible values on every power amplifier we sell. Remember: not all deals on audio amplifiers are created equal. Whether you're looking for a DJ amp, a new audio amplifier or any other type of power amp, we're sure to have what you need a the price you'll love. Cheap DJ Gear's success has largely been due to repeat business and referrals, and we get quite a bit of both. Why? It's all about value being offered on every sale of power amplifiers or anything we sell. It's the combination of incredible pricing, superior product quality and superb customer service that brings customers back for more. Their friends usually show up for discount amplifiers of their own, and so on, and so on. So whether your quest for your ideal amplifier leads you to a power amp, a full-range DJ amp or a PA speaker amplifier, you can bet your tweeters that we're going to make sure that three-point amplifier value is there on every sale. Whether it's a power amplifier or one of our PA system power amplifiers, expect the value. We do it for you, and we do it for us. You say you were looking for "cheap DJ amplifiers"? You won't find cheap DJ amplifiers here. You'll find only the good stuff, priced to SELL. That's how we'll get you back here later with your friends! You've discovered the discount amplifiers page at Cheap DJ Gear, where you'll find acres of quality DJ amps for less, period. Browse and discover the perfect DJ power amplifier or full-range audio amplifier for your system, at incredible -- yes, incredible -- savings. Your ideal amplifier might be a PA amplifier or a DJ amplifier, or maybe you've sifting in vain through countless DJ amplifiers for a power amplifier that matches your power output requirements. Chances are that we have the amp you need. However... if you found this web page by searching for terms like "cheap DJ amps" or "cheap DJ amplifiers," you've no doubt found the price range you expected. You also found a bonus: those prices are on THE GOOD STUFF! We appreciate your visit today, and look forward to serving you... with value. 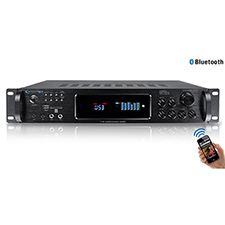 We carry a wide selection of car audio amplifiers here at CheapCarAudio.us. If you need to add some serious power a car audio amplifieris just what you need, from speakers to subwoofers we have the amplifier that will give your system the power it needs to sound it's best. When people refer to "amplifiers," they're usually talking about stereo components or musical equipment. But this is only a small representation of the spectrum of audio amplifiers. There are actually amplifiers all around us. You'll find them in televisions, computers, portable CD players and most other devices that use a speaker to produce sound. In this article, we'll see what amplifiers do and how they do it. Amplifiers can be very complex devices, with hundreds of tiny pieces, but the basic concept behind them is pretty simple. You can get a clear picture of how an amplifier works by examining the most basic components. Sound is a fascinating phenomenon. When something vibrates in the atmosphere, it moves the air particles around it. Those air particles in turn move the air particles around them, carrying the pulse of the vibration through the air. Our ears pick up these fluctuations in air pressure and translate them into electrical signals the brain can process. In the last section, we saw that an amplifier's job is to take a weak audio signal and boost it to generate a signal that is powerful enough to drive a speaker. This is an accurate description when you consider the amplifier as a whole, but the process inside the amplifier is a little more complex. In actuality, the amplifier generates a completely new output signal based on the input signal. You can understand these signals as two separate circuits. The output circuit is generated by the amplifier's power supply, which draws energy from a battery or power outlet. If the amplifier is powered by household alternating current, where the flow of charge changes directions, the power supply will convert it into direct current, where the charge always flows in the same direction. The power supply also smoothes out the current to generate an absolutely even, uninterrupted signal. The output circuit's load (the work it does) is moving the speaker cone. If you're happy with your P.A. speakers but you need a new amp, you're on the right page! Choose your new power amp based on the output wattage you need from the amplifier. Your P.A. speaker amplifier will be fan-cooled, rack-mountable and ready to pump out the sounds. 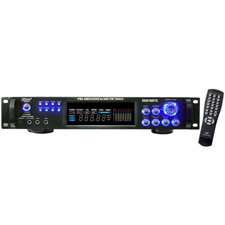 The DJ amplifiers you see here represent the best quality and value available for P.A. system power amplifiers. We're picky about the DJ power amplifier options we offer -- that's why we only offer the best and price them like discount amplifiers. We figure you'll be so pleased with your experience here that you'll come back for all of your DJ gear needs, and bring your friends who need P.A. amplifiers. Each DJ amp here is a specialized stereo amplifier that's built for power and clarity. 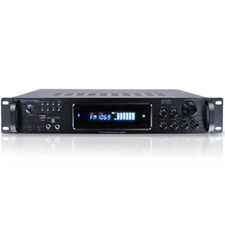 Select your new stereo amp from the power amplifiers you see here, and your audio amplifier will deliver the watts that you and other pros demand. When comparing other power amplifier products with ours, you'll soon see that P.A. audio amplifiers are NOT all created equal! Thanks for visiting our DJ amplifiers page. We look forward to serving you.